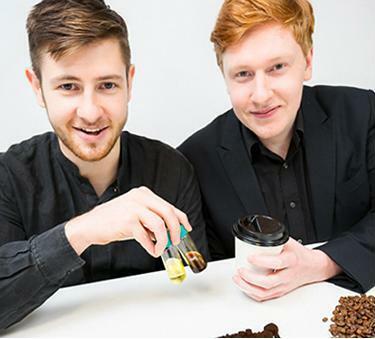 Bio Bean, the coffee grounds recycling company founded by UCL graduates Arthur Kay and Benjamin Harriman, has won a Santander Universities Entrepreneurship postgraduate award, including grant funding for their business of £20,000. The team triumphed after pitching their business idea in front of a panel of judges and were chosen out of five finalists, and beat off competition from institutions ranging from London Business School, the University of Cambridge, the University of Edinburgh and the Open University. The award comes just weeks after the company was also awarded $100,000 in funding at the inauguration of the Class of 2015 programme run by Founder.org. It was the only British team to win an award from the foundation, founded by entrepreneur Michael Baum, this year. The team has previously received backing from a UCL Bright Ideas Award in 2013, which provided seed funding for the company. UCL also put the team in touch with a mentor to provide business advice and support through the early months of setting up their business, to ensure it had the best start possible as an independent company. "It's great to see Bio Bean being recognised again for its innovative business approach to putting waste to good use," said Timothy Barnes, Director of UCL's centre for enterprise, UCL Advances. "Bio Bean has proved again and again that their business is viable, will make a positive and long-term impact on London's economy and environment, and has the strong potential to grow and create jobs."